i really enjoy having you all name the yarns. it makes me think of everyone in their context. like we all having images, memories, colors that spark a particular spark with us. i know sometimes it’s not so deep – but so many of the names you come up with i would never even think of! if i choose your name for a yarn and you would like to buy it, you get 5% off and free shipping to the US and Canada and reduced shipping by a couple of dollars to everywhere else. 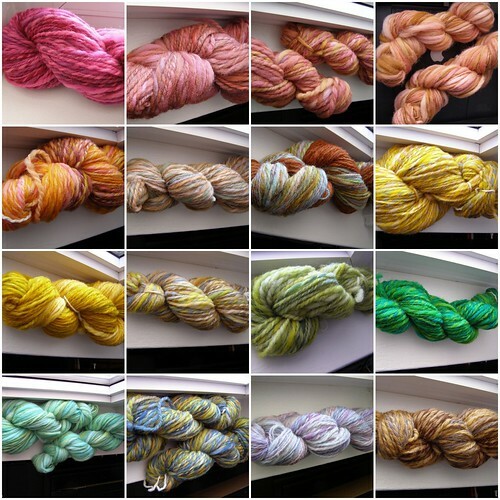 i think the naming will be a flickrly thing, since each yarn has its own particular picture over there. so comment there with suggestion and flickrmail or email me at my cosyknitsliterally address if you want the yarn after i choose a name. if i meld two names into one, either of you will be eligible. i will now withhold the choosing of a name for at least 12 hours so that everyone who wants to can have a chance to play. all this is to say – i appreciate you all! thanks for playing along with my hair-brained schemes! ERRATA: as i watch all of the suggestions come in, i know i’m not going to be able to pick… so, i’ve decided that the final word on the final name of each yarn is going to go to ben (with me harassing from the left). This entry was posted in contest, cosyknitsliterally, cosyspins, handspun, knitting, spinning by cosymakes. Bookmark the permalink. How do you come up with this stuff?? “Eskimo Kisses” for the blue/purple/pink/white skein. Second one in that row looks like Sunset over Long Island Sound to me. They’re all lovely – and picking names is NOT my strong suit, I always come up with something like “Green”.